Thank you for accepting my request to join the forum. First, a little about me and S/V Lady Anne. I'm a former U.S. naval officer and OEF vet, currently working in industrial sales in Knoxville, TN. My lovely wife Megan, our young son Edmund, trusty terrier "Mick" ,worthless cat "Mae", two guppies and I reside in Harriman's historic Cornstalk Heights District. 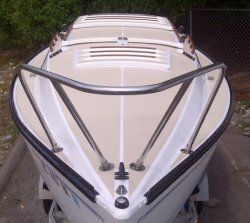 S/V Lady Anne is a '76 Chrysler C 22 "Sandpiper" swing keel I obtained from a gentleman recently moved here from Colorado. When I got her, she was in dire need of major repairs. 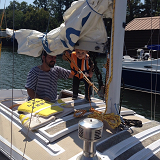 I and my father-in-law dropped the swing keel, replaced the pin and brackets, faired the keel, repainted the hull and topsides, replaced all running rigging, re-powered with a new Tohatsu 6 SP, and installed Lowrance plotter w/sonar. She's currently docked at Euchee Marina and Resort on fabulous Watts Bar Lake, TN...where one can (if up to the task) make for the Big Muddy and go all the way to the Gulf. Will post some photos (as soon as I figure out how to do so!). Welcome, and also working in Knoxville (not native Big Orange though ). I know that lake and marina well, but planning on using Cherokee Lake for most of my sailing this Spring. Did you find that C22 on Craigslist? That part about Colorado reminds me of one I saw there last year. On pictures, the board now supports adding attachments. All the usual file formats are supported, but there is a size restriction. I moved your post under 'General Chrysler Sailing Discussion' for better visibility. Thanks for the reply. Watts Bar is my "old stomping grounds"; actually went to BSA camp across the lake many more years ago than I care to admit. Christy and her husband are great folks, and you can't beat the chow at the Euchee grill. They have been very, very good to me and S/V Lady Anne thus far. When I took off my outboard for the winter ,they called me that night to make sure someone hadn't stolen it LOL! Real great about checking up on slip residents and advising anytime something looks "wrong" with your boat. Pulling in of a summer evening and having the bar just at the end of pier isn't bad either. Yes-did find her on CL. It probably was the same boat; originally blue w/red ablative, red trailer, teak interior? The boat was in worse shape than advertised, but in all fairness, I didn't get the impression the PO knew much about swing-keels. Otherwise, she was a peach...good interior, working electrical, excellent trailer. All in all, a fair price, though dealing with the wing was a hassle. Standing rigging is iffy at best, and that's on the list of future projects. Can't say I know Greg...I've certainly not seen another "Sandpiper" here this season. There's one over at Blue Springs, but she looks like she hasn't been touched in some time. Last edited by DizzyG78 on Wed Dec 20, 2017 10:35 am, edited 1 time in total.